When it comes to late-night dominance among advertisers, Jon Stewart and Stephen Colbert were the clear winners in recent years. 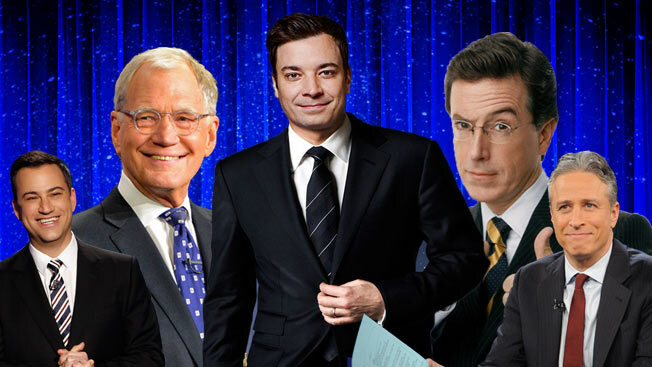 But starting next week, it will likely all come down to Colbert and Jimmy Fallon. That's according to advertising cost provider SQAD NetCosts, which tracked quarterly 30-second ad costs and CPMs for adults ages 18 to 49 for the three 11:30 p.m. late-night shows on broadcast TV, along with The Daily Show and The Colbert Report, going back to 2012. The Daily Show with Jon Stewart and The Colbert Report's advertising reign during most of that time—until Colbert signed off last December—reflects the Comedy Central shows' younger demographics compared with their broadcast competitors, as well as the appeal of Stewart and Colbert's shows "to inform as well as entertain," said Dan Klar, vp of product development for SQAD. In former Late Show host David Letterman, who stepped down in May, and former Tonight Show host Jay Leno, who left in February 2014, "you have two guys who didn't have as loyal a following as they did in their prime," said Klar. "There was a sense that it started to feel repetitive or it was the same kind of deal, while Stewart and Colbert were mixing news, comedy and social pieces that resonated with viewers in a way the other late-night shows didn't." 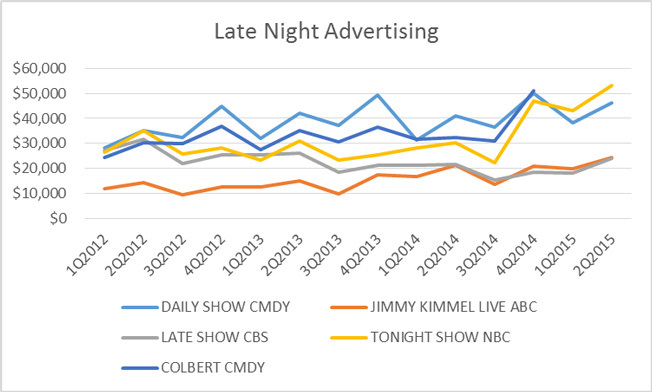 While younger-skewing Fallon took over The Tonight Show in February 2014, there wasn't a huge spike in advertising dollars until later in the year, as 2014's upfront money kicked in. In 2013, "advertisers weren't sure where the market was going to be going, and they weren't committing as much money to that time slot until a year later," said Klar. "Suddenly, you see that spike where the new upfront money had come in, and they said Fallon really knocked it out of the park, and we're comfortable committing this kind of revenue because he's getting the viewership. He's securing a younger, more diverse [audience] than Leno ever could." 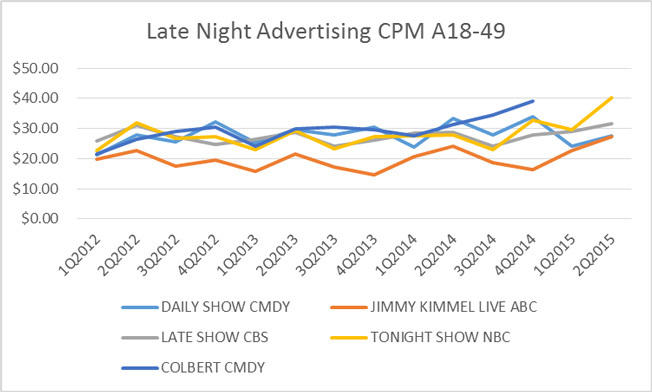 The Colbert Report surged in Colbert's final months last year, topping even The Daily Show during the last quarter of 2014 in both ad cost and CPM. Klar attributed cable's greater reliance on the scatter market, commercial time bought during the season instead of as part of the upfront, which gave Comedy Central more inventory to sell as interest continued to build around Colbert's departure and imminent move to CBS. "They have the ability to manipulate what they have available easier than network does, because not nearly as much is taken up for far in advance," said Klar. "In an upfront-designed market, it doesn't work quite the same way." While Fallon was able to take advantage of The Colbert Report's December finale and Stewart's retirement last month, overtaking both shows in ad cost and CPM, the standings are likely to shift again as The Late Show With Stephen Colbert kicks off Sept. 8 and Trevor Noah takes over The Daily Show a few weeks later. Advertisers are already betting big on Colbert's debut. "Based on the dollars I'm seeing, CBS and the advertisers are banking on that day to be a big day and for it to be a pretty successful debut," said Klar. "The dollars so far are higher than what they were for David [Letterman] with his programming." And that should continue after the debut considering that the upfront numbers for Late Show business were significantly higher this year than they had been under Letterman in recent years. "If Colbert is able to pull the same kind of audience that he had on his program and is able to follow through on what he claims he's going to be doing with this program—which is making it more informative and not so much of an entertainment only the way that Letterman did—then you might start seeing unit costs rivaling The Colbert Report," said Klar. "Advertisers certainly seem to be comfortable with Colbert coming into that slot, and they think he's going to be pretty successful."